It has become common practice for leading hotels to showcase their property using digital photographs, virtual tours and videos; after all it’s these visual images that help sell rooms online. But how can you go beyond just selling rooms, to selling a proposition; to increasing and retaining brand loyalty and further improving the appearance and usability of your hotel? 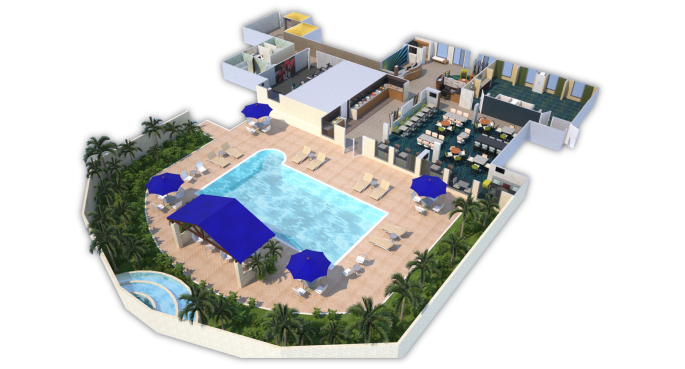 2D and 3D Rendering Designs accurately display the layout of a hotel, depict the location of its facilities and show case room sizes. Having a visual that reflects all this information at one glance can help to convey your hotel’s proposition – its size, its expansive layout, the breadth of its offering etc. If you are appealing to families for example, they want to see the range of facilities, their proximity to each other, the size of the suites. The best way to illustrate this information beyond using copy that people don’t care to read is through Rendering Designs. If you are planning a refurbishment or renovation to your hotel, it’s important to share the expected changes with your customers, helping them to feel involved and loyal to the brand. The 2D & 3D Rendering Designs are a great tool to illustrate the changes and these can be displayed on pop-up stands in the hotel lobby and on your website, similar to what SpringHill Suites has done. You can refer potential customers to the Rendering Designs during a booking enquiry. Results have shown that giving customers visibility of the choice of rooms available has increased the extended stay opportunity of guests and helped to upsell higher value rooms. Use the 3D Rendering Designs to identify opportunities to further improve the public spaces at the hotel. The designs can show you where existing walls and corridors are not adding value and hindering some of the public spaces. So if you want to go beyond selling rooms to growing a brand and improving customer satisfaction, 2D & 3D Rendering Designs are definitely worth considering.